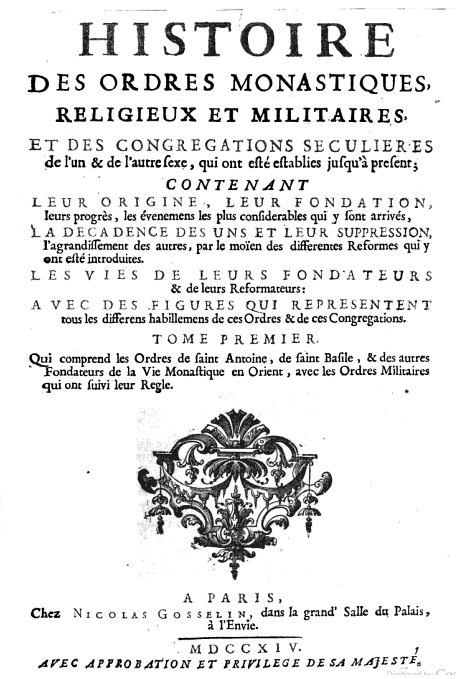 Figure 1: Title of Tome 1 of Histoire des ordres monastiques, religieux et militaires, et des congrégations séculières by Pierre Hélyot and Maximilian Bullot. 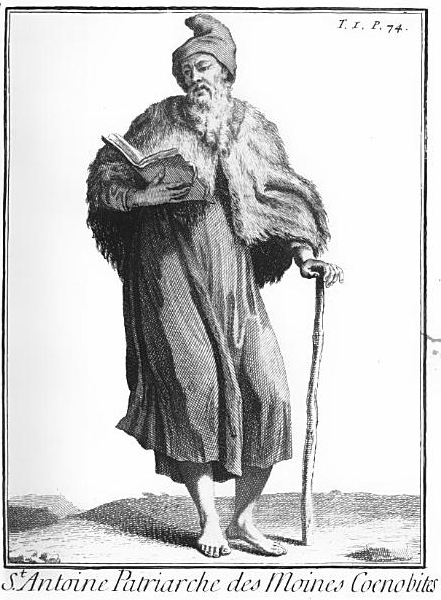 Chapitre VIII: Des Moines Coptes ou Egyptiens[iii] (The Coptic or Egyptian monks). 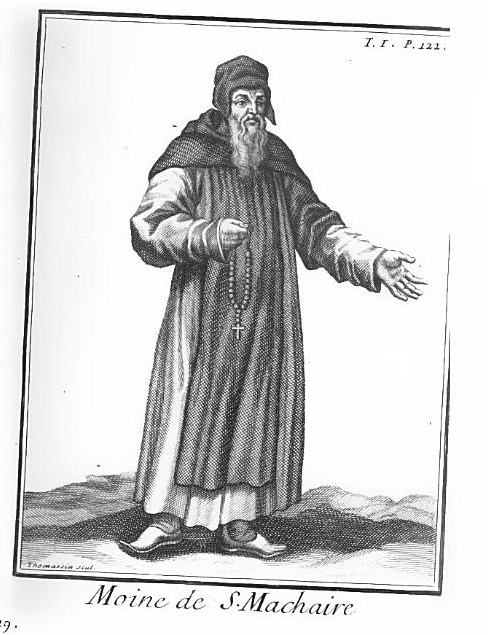 Chapitre IX: Des principaux Monasteres des Moines Coptes[iv] (The principal monasteries of the Cooptic monks). The reader is to find this in Planche 1 (Plate 1) at the end of the Dissertation Preliminaire section; p. 67. 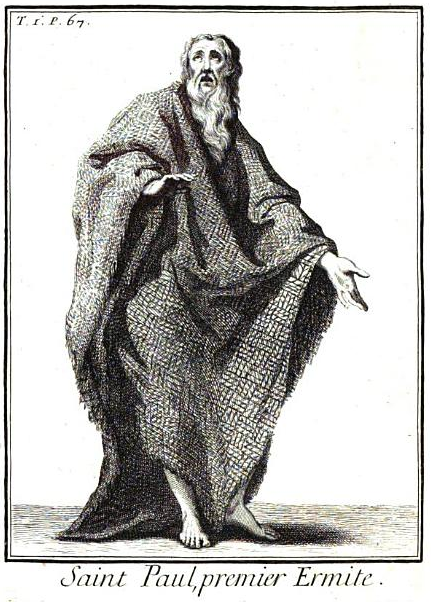 The reader is to find this in Planche 2 (Plate 2), in Chapitre II: Vie de Saint Antoine Abbé; between pages 74 and 75. The reader is to find this in Planche 18 (Plate 18), in Chapitre VIII: Des Moines Coptes ou Egyptiens; between pages 114 and 115. The reader is to find this in Planche 19 (Plate 19), in Chapitre IX: Des principaux Monasteres des Moines Coptes; between pages 122 and 123. 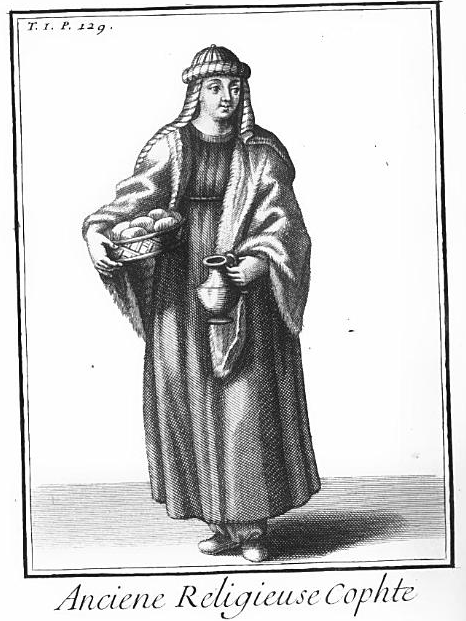 The reader is to find this in Planche 20 (Plate 20), in Chapitre IX: Des principaux Monasteres des Moines Coptes; between pages 128 and 129. I guess one thing we can learn from these beautiful pieces of art, which were possibly made by Thomassin, is that Coptic monks in the early 18th century did not wear a uniform religious habit. Planches 18 and 19, Moine Cophte (Coptic Monk) and Moine de S. Machaire (Monk from the Monastery of St. Macarius [Abu Maqar]), show that very clearly. 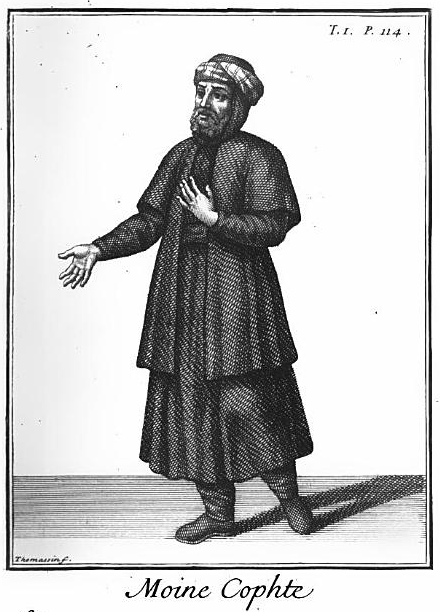 We have seen in a previous article[vii] that the Coptic clergy in the second half of the 16th century wore fanciful hats (berretto ‘bornaita برنيطة’). It seems that the final standardisation of the religious habit of Coptic monks, nuns and priests only occurred in the modern age. Before that, there was wide variation – particularly, Coptic religious men and women did not always wear black. For this we shall return again. [i] Volume 1 & 2 in 1714; Volume 3, I could not find a copy of it, but suspect it was published in 1715; Volume 4, in 1715; Volume 5, 6 and 7, in 1718; Volume 8, in 1719. All volumes, except Volume 3, have now been digitalised, and copies exist in the Internet Archive. [ii] In addition, there three other valuable chapters: Dissertation Preliminaire (pp. 1-66); Chapitre I: Les moines de saint Antoine, etc. (pp. 67-74); and Chapitre II: Vie de Saint Antoine (pp. 74-81). [iii] Histoire des ordres monastiques, religieux et militaires, et des congrégations séculières; tome 1; pp. 114-122. [vi] The English translation is mine.